Sunday, November 11, 2018 3:00 p.m.
We Too presents works by women spanning 1000 years: from St. Hildegard von Bingen, famed medieval Abbess, philosopher, visionary and composer to one of today’s most talented stars, Caroline Shaw, 2013 Pulitzer Prize winner. Also featured is a fiery string quartet by the tragically underrated Fanny Mendelssohn (you’ll decide whether she was perhaps even more original than her brother Felix?) and a solo violin work by the inspirational American composer Joan Tower. 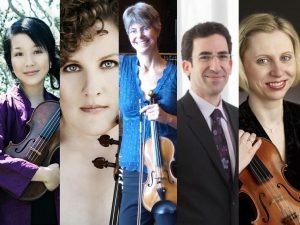 We are proud to welcome Oberlin Conservatory’s Professor of Cello and doctoral graduate of the Juilliard School, Amir Eldan along with Oberlin Conservatory’s Associate Professor of Viola and first prize winner of the Primrose International and American String Teachers Association Viola Competitions, Kirsten Docter. Isabel Trautwein, a first violin member of the Cleveland Orchestra since 2002 will join with a fellow first violinist of the Cleveland Orchestra since 2011, Katherine Bormann. All will be joined by an audience favorite: Mari Sato, a long-time member of the Cavani Quartet on violin. Order early for guaranteed seats! Season subscriptions, as well as individual concert tickets are available for purchase at Heights Arts, 2175 Lee Road in Cleveland Heights, via phone at 216-371-3457, or online beginning September 14, 2018. We are pleased to offer reduced-price tickets for students ages 8-23, thanks to generous funding from the Paul M. Angell Foundation. Students under the age of 18 must be accompanied by an adult (who also qualifies for the student ticket price). All concert venues are wheelchair accessible. Directions for concerts at private residences are mailed a week in advance. Advance ticket purchase is necessary as seating is limited, and Close Encounters concerts have a tradition of selling out.